Fill your room with the lively, warm blend of vetiver and lime, balanced with ginger and cardamom, captured in the finest home perfume diffuser. Our Nordic Spa scent has been lovingly handcrafted by our experienced perfumers, to promote Scandinavian simplicity, style and elegance in your home. Marrying the sweet, balsamic fragrance of cardamom with the warm, lingering scent of vetiver, the Parks Nordic Spa Diffuser embodies the tranquil and elegant surrounds of a Scandinavian spa – helping to create a truly serene environment. And, as a final flourish, we’ve added ginger and lime to help enliven and lift the fragrance, promoting natural vitality and rejuvenation. Vetiver is a stimulating and provocative fragrance, closely resembling lemongrass, from which plant it’s derived. However, unlike the fresh, citrus scent of lemongrass, the scent of vetiver is deeper, woodier and earthier, with subtle notes of soil and balsam. This richness makes it the ideal base note for our elegant Scandi-inspired room diffuser, delivering a warm, rounded fragrance that’s luxurious and satisfying when paired with the spice and fruit notes of ginger, lime and cardamom. The Nordic Spa Diffuser is a luxury, handmade product, lovingly produced as part of our special Nature’s Own collection. All the products in this exciting range are made using only the finest ingredients, and benefit from a natural oil that evaporates slowly, giving pure, long-lasting fragrance for up to 14 weeks. 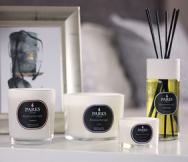 Like all our home fragrance products, the Nordic Spa Diffuser is supplied in a charming gift box – ideal as a luxury treat for that special someone.